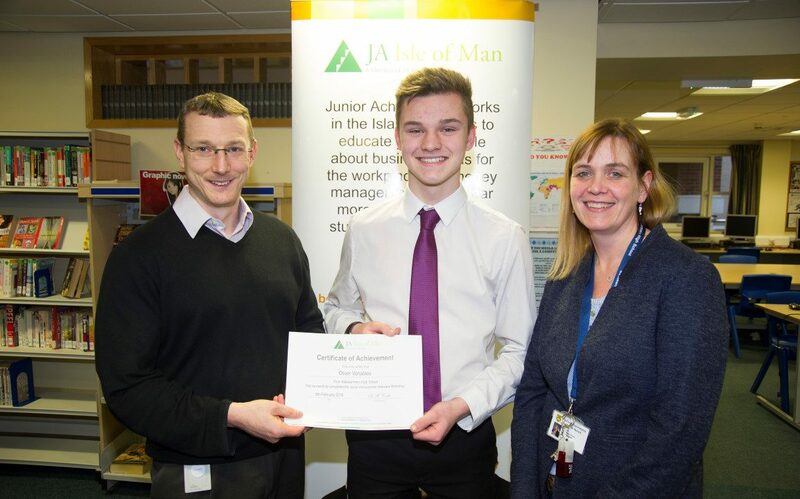 Oliver Venables has become the 1000th student to have attended a mock interview workshop at Ballakermeen High School organised by Manx charity Junior Achievement. Now in their sixth year the workshops are part of Junior Achievement’s work to prepare school leavers for the jobs market, giving students the opportunity to experience ‘real-time, real-life’ interviews with volunteer recruitment professionals from some of the Island’s leading employers. Ballakermeen High School’s key stage four leader Fiona Roome said: ‘These workshops are such a valuable opportunity for students, who will have already benefited from Junior Achievement’s Learn to Earn programme that helps young people to develop the soft skills employers expect candidates to have. Ahead of his interview with Colin Coole and Jamie Watts of the Stars Group, Oliver, 16, said: ‘My brother did one of these interviews and said how useful it was. When you’re in your last years at school you know you could be looking for work really soon. Going into one of these interviews is a good way of getting you to think about getting your cv together and attending your first interview, but in familiar surroundings. I’m hoping to complete my “A” levels then go on to university and what I learn from this mock interview will serve as a benchmark for me. The Stars Group’s HR business partner Colin Coole said: ‘It’s important employers help to bridge the gap between full-time education and the world of work. As employers, we want students to be prepared, so the onus is on us to reach out to them in ways such as these interviews and help to equip them with life skills. It’s also important from a wider, Isle of Man perspective and you never know what standard of candidates you’re going to find. For example, some years ago we identified two candidates who were “real gems”. The interview over, Olivier said: ‘It was brilliant. I was nervous at first but the experience taught me how to act in an interview. I was asked all kinds of questions and I got the chance to ask about the Stars Group, too. Organisations supporting the workshops were: The Co-op; Department of Education, Sport and Culture; Department of Health and Social Care; Isle of Man Constabulary; Office of Human Resources; Stars Group; Swagelock; and Zurich International Life.